Welcome to NZrFL50! For this league we will be using the newly updated version of the Flat6 mod by EnduRacers. The first round kicks off on February 12th in the Motherland with Monza. After that we head stateside for 5 more rounds of racing. Riven has very kindly put a server up already, with the mod and Monza which is Round 1. 1: Download the file from above, and save it into your rFactor 2 Packages folder - this can be found by right clicking rFactor 2 in Steam, going to properties, local files, browse local files. 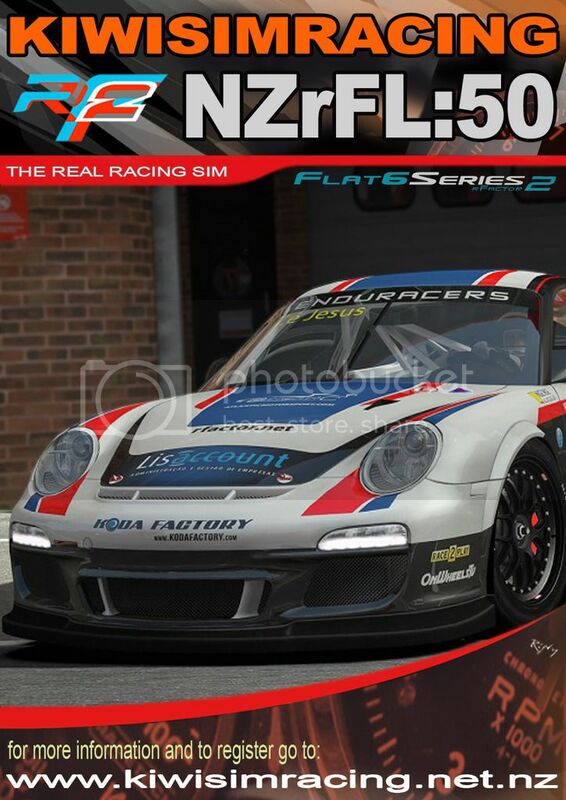 3: On rFactor 2 Launcher screen, click on the box icon (second icon on the left). 4: Scroll down the list until you find the track name or filter by uninstalled. 5: Click on the track name, then click on install at the bottom. 6: Repeat Step 4 & 5 for each track. 9:40pm - Race 3 - 30 Minute Race with 1 Compulsory pit stop. Qualifying will be a 15 minute open session to complete as many laps as you wanted. Please keep Discord chat to a minimum during this time. Also please strictly adhere to blue flags during this session and only use headlights if you are on a flying lap. We will also be utilising a weight system throughout the league based on finishing order of each race. The amount that is added\taken off will dynamically adjust dependant on the size of the field. We will be utilizing the RF2 analyser tool that was used in the Australasian GT3 series last year. This does not require manual sing-ups by drivers. We will also be running official practice nights on the 29th and 5th to ease us into Tuesday night racing. I'll be there from about 8, I can add weight to people as wanted, run some short races etc. Please note that tire wear has been changed to 1x for the league. I have edited the first post. We'll be using the RF2 analyser tool for the points this season (same tool as used in the Australasian GT3 series last year). This does not require manual sign ups on a per-driver basis. A link will be set up in the coming days and posted for all to view. Link for the points site has been updated on the main post. Thanks for organising and hosting this series! The weight system worked quite well and there was some great racing to be had! Interesting choice of venues too, the majority were new to me. Thoroughly enjoyed the racing, thanks to everyone who showed up! A big thanks to Obsc3ne for running the league. The mod is pretty forgiving and you can really throw the cars around, and the league structure with the weights etc was spot on. Thanks for running this league man. great work! With the final video up, that's my wrap on the season. Cheers to all the participants, was very enjoyable racing throughout. Thanks as usual to Riven & Inspire for hosting. Cheers Obscene or the Series and Riven and inspire for the Server.